Aviation Analysis Wing: The SAAB Gripen fighter further demonstrated its versatility with a series flights using 100 percent bio fuel. The flights marked the first time a single-engined fighter flew with 100 percent biofuel. 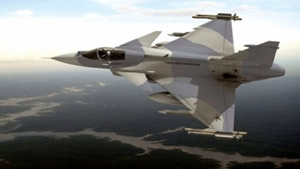 A twin seat Gripen D was used for the flights that took off from Saab’s facilities in Linköping, Sweden. The bio fuel called CHCJ-5 was made of rapeseed oil, and the Volvo RM12 (license built GE F404) engine powering the Gripen made no difference as to whether the fuel is based on crude oil or vegetable oil.